The Happy Grandma: TAAA DAAAAA!!! The quilt is finished. I finished it last night about midnight. This is Grandpa's quilt since he picked out the pattern. 51 years ago today Grandpa gave me an engagement ring. How appropriate to give the quilt to Grandpa today. 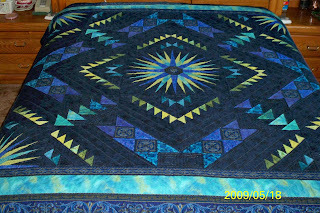 The quilt was hand pieced, machine foundation pieced and hand quilted. Now I can go to the 3 unfinished quilts and work on them. That looks amazing. It's absolutely beautiful. Congratulations on finishing it! Oh Mom!!!! It's gorgeous! So beautiful!!!! Nice work and congratulations! That is so beautiful, Grandma!!! WOW!